Lipids serve as the largest energy source, cell membrane components, and bioactive mediators. 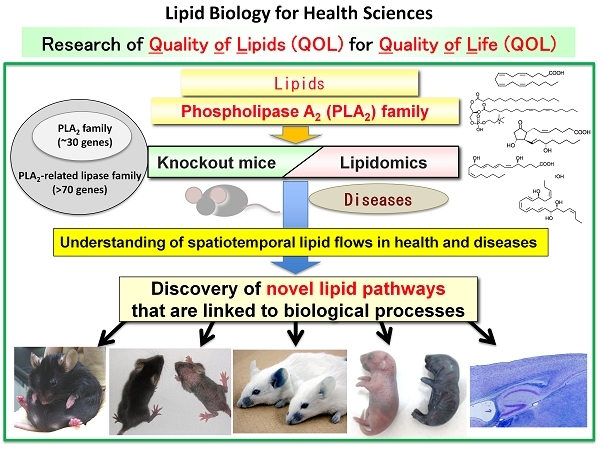 Lipids are major environmental substances supplied as nutrients and spatiotemporally regulate a variety of biological responses in response to given microenvironmental cues within tissues. Our research focuses on the regulation of biological networks driven by lipids and their metabolites. By taking advantages of an array of gene-manipulated mice for lipid-metabolizing enzymes and receptors, we aim to clarify novel lipid-orchestrated mechanisms underlying various diseases such as metabolic and immune disorders. Knowledges obtained from these approaches will be translated to humans toward discovery of new biomarkers or druggable targets.